Thank you to the TuneCore service for setting up the digital distribution. Congratulations to Claire and all her students, and thanks to the many audience members who bought a copy of Rachel’s CD. The out-of-stock situation at CD Baby only lasted about a day. We knew the first batch would sell out quickly so we sent the second batch on May 9; the first batch sold out on May 11, and the second batch arrived on May 12. So after the one-day pause, sales resumed. In addition to the good news from CD Baby sales, we hear good news from Rachel’s mom on direct sales. AlsTunes is still recovering from an awesome CD kickoff party held last night at the house of Rachel. It was pretty amazing; lots of friends and family; mainly human, although there were dogs, one snail, a big fly, and rumors of a turkey. The highlight of course was Rachel’s performance of her song “Tell Me You Love Me” which brought the house down. That and the cinnamon cookies. Stay tuned for updates, photos, and possible videos. And thanks to Rachel’s mom for organizing a truly memorable evening. Since the CD was released a few days ago, your support has been really gratifying, and the first batch of CD’s is now sold out on CD Baby. But that’s only temporary; I’ve already sent a restock batch to our friends at CD Baby, so sit tight. You should be able to resume buying CD’s when they receive it in a few days. Now on Sale at CD Baby! 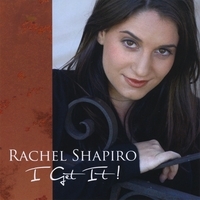 You can now buy Rachel’s CD at the Internet’s favorite CD retailer, CD Baby! Check it out! Write a review! Today is the targeted release date for “I Get It!”, and although CD Baby confirms that they have received the first batch of CD’s, they still have some processing to do before the link goes live. Watch for updates here; it won’t be long! The manufacturing task is finished; I now have boxes and boxes of CD’s! It’s pretty cool; there they are. They need to be heard! The CD’s, with jewel case, 4-page insert, tray card, and CD label art, were replicated by the local firm New Cyberian. This company did a first-rate job, quickly, and at a great price. I highly recommend them. I expect to use them again. I’ve been advised by Rachel’s mom that people are already buying the CD in advance. Cool! The manufacturing is due to be finished in a day or two, and since they’re local I’ll just drive over and pick them up. Then I’ll play a few to make sure they sound OK, and send a batch to CD Baby, and another batch to Amazon, and another batch to Rachel’s mom so she can deliver the CD to her customers.